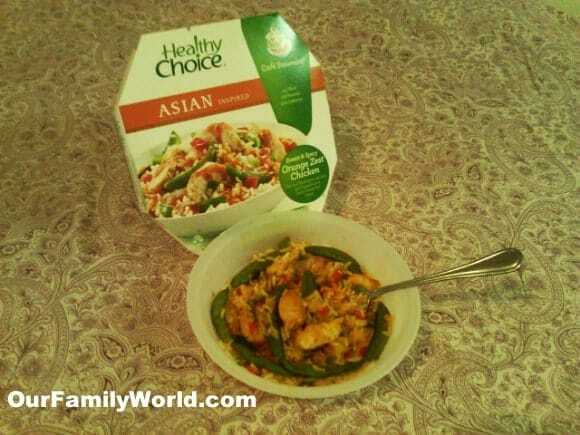 I recently had the opportunity to try a Healthy Choice frozen meal. I had trouble deciding which one to get, but ended up picking the Orange Zest Chicken. After tasting and researching the company, I discovered that Healthy Choice frozen meals are both healthy and delicious. The Orange Zest Chicken is from the Healthy Choice Cafe Steamer line. What I noticed right away is that it came with a steamer basket. 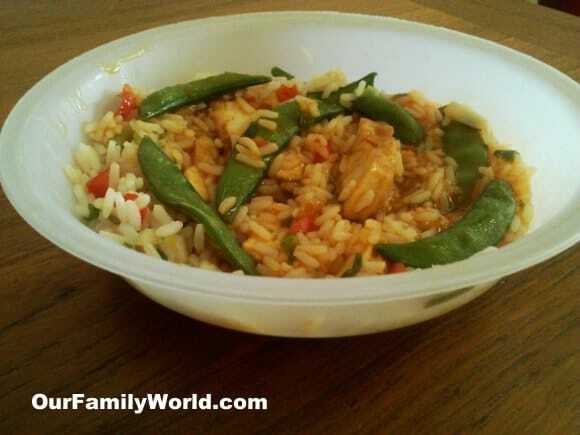 The sauce sat on the bottom of the bowl, while the rice, vegetables and chicken rested in the basket on top. After it was done cooking in the microwave, the box instructs you to take the basket out and pour the contents in the bowl and stir. I was pleasantly surprised when I ate this meal. Normally, frozen dinners that have chicken tend to taste rubbery to me, but that is not the case with Healthy Choice. The chicken actually tasted like real chicken! I enjoyed the vegetables and they were cooked perfectly. The orange sauce went together nicely with the the rest of the ingredients and it was not overpowering. Also, the portion size is exactly what it is supposed to be according to dietary recommendations. I have to admit that while I thought that they had healthier options than other frozen products, I was not expecting it to have so little fat and calories. They make their products with apples instead of sugar and rather than adding salt, they use a splash of red wine. As a busy mom, I often scramble at dinnertime to find something quick and healthy to put on my table. While I use frozen vegetables quite a bit, I never considered using Healthy Choice meals. Now that I have had the chance to taste it, I am looking forward to trying their other products. I have discovered that Healthy Choice provides real, high-quality ingredients including tender meats and crisp vegetables. In fact, the vegetables go from the farm to the freezer within 24 hours, which explains why they tasted so fresh! 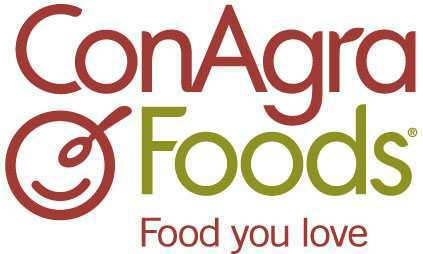 ConAgra Foods owns both Healthy Choice and Marie Callender’s. They have over 80 meals that contain less than 400 calories so variety will never be a problem! After analyzing the nutritional information and tasting it for myself, I recommend trying Healthy Choice for yourself so you can enjoy the taste and convenience while knowing you are feeding your family a nutritious meal. Healthy Choice and Marie Callender’s created a video that follows two women on the adventures of their daily lives, imagining how new technologies will impact their routines, especially in the grocery store. From apps that store your grocery list to recipe research on Pinterest, the landscape of shopping is quickly changing. With various resources available to consumers, they are now, more than ever, interested in learning where their food is coming from. And just in time for National Frozen Food Month (March), these brands are helping shoppers to predict the future of shopping for frozen food! I will have to try one of these for myself! I know what you mean about rubbery chicken – yuck! Let me know what you think, MultiTestingMom! Mel, it was delicious! I was really surprised because I didn’t expect a frozen meal to be healthy and good. Loved it! This looks pretty good. I need to try these out. That looks really good! I’m a big fan of HC meals! This looks really good! I am on my last month of Nutrisystem and will need to transition to other foods. This looks like something good that would work for me. Can’t wait to try some of these Healthy Choice meals! Daisy, this was so delicious – you will really like them!! !